"There's a cure for everything except death." It's easy to claim too much for a film�its greatness, its significance, its influence�but whatever superlatives you want to throw the way of Bicycle Thieves, it can stand up to them, and then some. Much of that must be due to the fact that it's quite a simple movie, really, one that almost prides itself on its lack of adornment. If making a great Neorealist film were as simple as taking the camera out of the studio, everybody's home movies would be masterpieces, and if poetry and resonance were easy to come by, there would be no pretentiousness on screen, at the art house or elsewhere. But Vittorio De Sica's delicate, small movie is an extraordinary achievement, never tarted up and never posing. It's always something of a thrill to watch, to see the power of cinema pared away to only the essentials, and this DVD release is a great, great pleasure. De Sica was one of a band of young Italian filmmakers who came of professional age at the very end of and just after World War II, and, with Luchino Visconti and Roberto Rossellini, he changed the way that movies are made, not just in Italy but around the world. They were interested in telling stories set in the world they knew, an urban world of poverty and unemployment and dreams, and in capturing the flavor of daily living that they never could within the grand confines of a soundstage. So they took their cameras to the streets, and found stories to suit their style, which had a decidedly documentary feel. De Sica's Shoeshine was the necessary precursor to this, his next film; both are unsparing about the deprivation facing so many of Italy's citizens in the late 1940s, but are generous enough to imbue the lives of their characters with a kind of grace. Lamberto Maggiorani plays Antonio, a devoted husband and father of two, who, like many of his friends and neighbors, simply cannot find any work, until a gift falls from the heavens: a job putting up posters on the streets of Rome is his, as long as he can provide his own bicycle. The opportunity is too good to pass up, so he and his wife sell their sheets, providing them with enough cash to get Antonio's bike out of hock�now he will earn a proper salary, and be the provider for his family he so longs to be. Of course, disaster strikes almost immediately, for on his first day on the job, while plastering up a glossy image of Rita Hayworth, another desperate character comes along and steals Antonio's wheels. The rest of the movie consists almost entirely of Antonio's chase, his desperate effort to get back his bicycle; it becomes an almost existential quest for him, the fulcrum of his life. (Yes, on some level, Pee Wee's Big Adventure is a bizarre little remake.) Antonio's older son Bruno goes along with his father, and though not much is said between them, we sense deeply how much the boy idolizes his father, and how badly Antonio wants to do right by him. De Sica's Rome is a city of neighborhoods, not a great sprawling urban mass, but tight little units where people know you, and your family, and your reputation, all of which are at stake for Antonio in his quest. The director also has a keen eye for architecture�he understands how public space functions, how the life of the street works, and how, for instance, a staircase can offer both promise and peril. And simply shooting in Rome in 1947 and 1948 shows us a populace badly deprived, yet this is also a place where work is respected, and labor has an almost noble quality to it. The city feels lived in, not dressed to the nines; De Sica captures the expressive quality of his actors' faces by letting them be, not leaning an excess of closeups. The full-out dragnet to get back the bike is only part of the point�we empathize with Antonio, yet we also see him through Bruno's eyes, and when the almost holy quest goes badly and Antonio takes another course of action, it's a moment of shattering disillusionment, both for Bruno and for us. 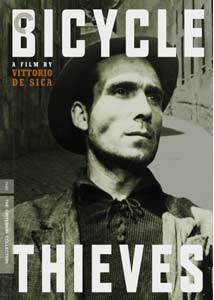 I probably shouldn't be posting this on a site dedicated to reviewing DVDs, but on some level this is a movie that you don't want to talk about or read about too much, because there's almost a purity to Bicycle Thieves that no essay or well-meaning film fan should spoil for you. It's a great, great film, and if you haven't seen it already, make this Criterion release your reason to do so. Image Transfer Review: The film looks as fine as I've ever seen it, and Criterion's job is particularly creditable when compared to some of the shoddier earlier releases of De Sica films on DVD. Alas, the ravages of time are evident now and again, with some jumpiness in the frame and distracting vertical lines indicating damage to the source material. Audio Transfer Review: Why you would want to listen to the dubbed English track I cannot imagine�it would be like watching a colorized Citizen Kane, or something. The Italian track sounds just fine, even with the inherent limits of a mono track now almost sixty years old. Extras Review: Criterion's extras are well chosen and informative, but it's a bit of a surprise not to see more here, actually�given that films of far lesser stature that have been given all sorts of bells and whistles on DVD, it's a modest disappointment, for instance, that there's no commentary track here. But the accompanying second disc features three illuminating documentaries. Working with De Sica (22m:41s) includes 2005 interviews with film scholar Callisto Cosulich, who provides context about De Sica's career as an actor stalling out before he turned to directing; Suso Cecchi d'Amico, one of a passel of credited screenwriters on the project, who in numerous sittings goes over the evolution of the script; and Enzo Staiola, now all grown up, talking about meeting De Sica and getting cast as the little boy. Neorealist scholar Mark Shiel presides over Life As It Is: The Neorealist Movement in Italy (39m:55s), going over both the aesthetic and political aspects of this school of filmmaking, which was one of the unintentional consequences of the strange 1930s Italian mixture of Fascism and Hollywood. And Cesare Zavattini (55m:38s) is director Carlo Lizzani's affectionate look at one of the founding fathers of Neorealism and another of the screenwriters on Bicycle Thieves�this is a full-boat biography, starting with Zavattini's childhood in Luzzara, his work with De Sica not just here but also on Umberto D. and Miracle in Milan, and tributes from other directors, including Bernardo Bertolucci, Roberto Benigni, and Marco Bellocchio. The accompanying booklet makes for a good read as well�it's crammed with essays on the making of the film, remembrances from De Sica and Zavattini, thoughts from directors Sergio Leone and Charles Burnett, and meditations on the film's aesthetic, among other pieces. This is in some ways such a modest film that it sounds a little foolish and bombastic to claim such great things for it. But it truly is nothing short of a masterpiece�an accessible, resonant story, a vital document in the evolution of postwar cinema, and a movie of peerless influence. I couldn't recommend it or any other film any more highly.